Enter your 5 digit zip code to check free delivery options! 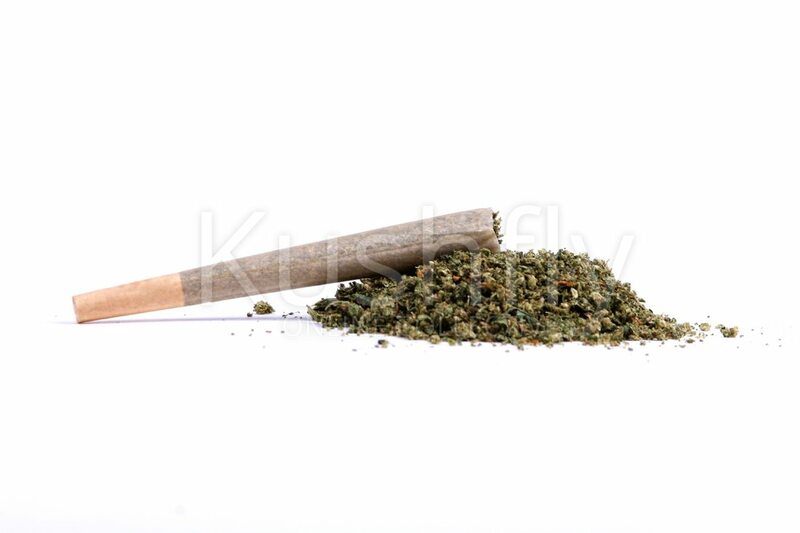 Kushfly Pre-Rolled Joint is rolled by Kushfly budtenders in preroll cones. Our joints are rolled with indoor shake. Might contain small amounts of sugar leaves which won’t affect the taste or quality of the medication. They come in airtight joint tubes. (Single Joint orders only) Current joints have been rolled with our Madman OG flowers. Awesome buds, good quailty, will come back again for sure. I bought three of these. Perfect roll. Not overly packed and burned good. Good quality bud. Delivery was spot on. Will get some of these each time I order from now on. I love this pre roll because I have bad fingers but couldn’t afford these in most places. Slow burning, great tasting, enjoyable feeling. So I’m usually not a fan of the pre rolled’s, but I will make an exception for kushfly. Their pre rolled joints does the job. I was very surprised. Like literally. Kushfly’s prerolled joints are great. They are high quality weed and are packed just right – not too tight or loose. Reliable and consistent – XLs are worth the $3! This XL pre-rolled joint is absolutely worth it! Not only is it good quality, but its extremely well grinded. It is just one joint but it can easily be made into 3 small joints! Makes your money worth it. Some dispensaries use low shelf weed in their pre-rolls, but Kushfly’s always taste great & fresh! Would recommend their pre-rolls over most other places. I usually burn through these pre-rolled joints pretty quickly. But, this one from Kushfly was quite substantial. Felt the effects after a few puffs and put it out when I became sleepy. Woke-up to find most of the joint still there. Smoked the remainder for a nice head high and continued relaxation through the evening. Their pre rolls (XL) are the best in the city, and saving the tubes for a little discount on the next order makes them that much better! I love these pre-rolled joints. They are so much better than I could ever pull off, and I adore the little tubes they come in. It seems silly to buy a joint for this price but I think it’s worth the money. Especially because of how conveniently they are packaged. I been ordering these with my orders and I’ve been satisfied with both type. They are rolled right and tight with good quality bud. I will continue to buy them. Don’t let the fact it’s a house J fool you! High quality from Kushfly always! I absolutely love this product and am a repeat buyer. Perfect for road trips or if your outdoors and just want to take in a view. You get a lot more bang for your buck too, as I medicate daily but usually clip the joint several times before it is finished. I love this joint. Its the perfect roll. Last time got me and my boyfriend a different type of feel, definitely will purchase again! These things are great. The new ones are even better than the originals. Highly recommended especially for a little addition to your order. Ordered a three pack, and found customer service extremely helpful and prompt when dealing with issues with the website ordering. Order was literally delivered in less than 15 minutes from the time it was placed. Joints are well-packed and the flowers are excellent quality! I always order the value pack. You get 3 XL joints and they are on point. Perfect roll .. bud is great! Highly recommend. will definitley buy again! great roll and good bud. lasts loooong, smokes well. Love the size and the price! Like others said, these are good quality, packed well, and get the job done. The packaging makes it convenient to take on the go, too. These pre rolled joints are terrific. Smooth burn. Just the right size. Hassle free toke. Will definitely buy again!! I’ve actually never been a fan off medicating with joints in the past I’ve negative experiences purchasing pre rolls. Buds were never potent but after trying your pre rolls I actually have a different outlook the strains used in your pre rolls taste great and smell even better I enjoy the indica pre rolls very much. Saves me time when I’m getting home from work just pop the tube light and enjoy . Great quality, burns slowly! Definitely will continue to buy. Go for the XL for sure! You don’t need many puffs or good rolling fingers with this pre-rolled, some of the best in Los Angeles. Also, please turn in the tubes for extra points on your next order! Pretty good – but they are SMALL compared to most other pre-rolls I’ve purchased. Love Kush Fly’s Pre-Rolled joints! I always get the sativa and it helps boost my creativity! Would def recommend any type of artist to purchase this! I love these! Great to smoke just before bed. Plus the price is great. Kushfly Prerolled joints are terrific. nicely rolled and good quality for the money. Delivery a breeze as well, thank. Very nicely packed and rolled. The bud burn slowly and does not leave an unpleasant taste in the mouth. I felt a mellow high, and a clear mind. The best for stress relief, especially since I dont have to stress about rolling a perfect one myself.